Songs of Eretz Poetry Review: New Poem: "Treasure Hunt"
"Treasure Hunt" is the latest addition to my poetic memoir, A Wave of Poetry. 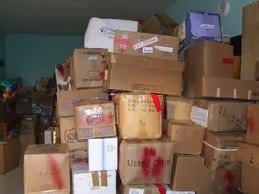 As the Air Force's role in the tsunami relief mission was winding down, there were still many medical relief supplies jumbled together and mixed with other random supplies. I was tasked to lead a team to sort out and organize the medical supplies. It was a kind of treasure hunt.